Part six in our eight-part series on fragrance related holiday gifts brings us to the random / miscellaneous category, including a few teas. Do add any of your own recommendations in the comments! 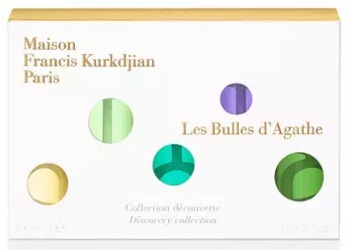 From Maison Francis Kurkdjian, the Les Bulles d'Agathe discovery set: "A discovery gift set of five scented bubbles, designed to introduce children to smells ... and to give adults a chance to have fun!" with five 45 ml bottles, including Violet, Cold mint, Cut grass, Pear and Mon beau Sapin. $75 at Neiman Marcus. 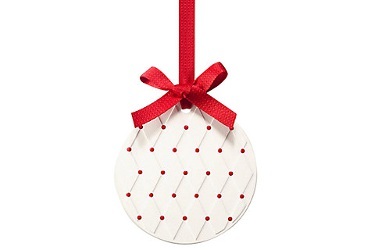 From Jo Malone, a scented ceramic Christmas ornament: "A playful token for the tree in refreshing Pine & Eucalyptus. The festive scent of Christmas morning." £32 at John Lewis in the UK. Or the Jo Loves version, with 100 ml Christmas Trees fragrance (home or body) plus hanging ceramics: "Designed to decorate your home with the familiar scent of Christmas, fill the air with notes of fresh pine, aromatic lavender, spiced incense and warm amber. Mist directly into the air and onto ceramics, time and time again to keep the scent alive." £105. 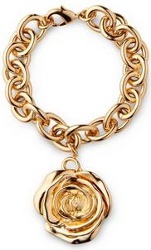 From Aerin, the Rose De Grasse Solid Perfume Charm Bracelet & Necklace: "A pairing of jewelry and fragrance to symbolize beauty and femininity, this limited-edition set is perfect for gifting. The set includes a 18k gold plated link bracelet and a necklace, and a detachable compact in a multi-petaled rose design containing Rose de Grasse solid parfum. Rose de Grasse has at his heart Rose Centifolia, hand-picked in Grasse, the French capital of perfumery since the 16th century, enhanced by Rose Otto Bulgarian and Rose Absolute, and given further depth by warming Musk. It comes beautifully packaged in a white and gold box." $250. From Marvis, the Marvis Toothpaste Flavor Collection Gift Set: "Discover the 7 unique experiences of the Marvis product line: Amarelli Licorice, Aquatic Mint, Cinnamon Mint, Classic Strong Mint, Ginger Mint, Jasmine Mint and Whitening Mint. Marvis is a luxury line of oral care products that turn your daily teeth cleaning ritual into a wonderful sensory experience. Our gentle xylitol- and sorbitan-based formulas cleanse and condition your teeth and gums without causing irritation." $36 at Amazon Prime. 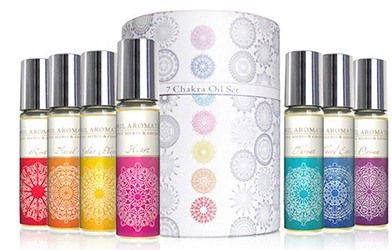 From April Aromatics, the 7 Chakra Oil Set, with seven 10 ml roll-ons: "A combination of 7 different blends, according to the different chakras, or energy centers of the body. Each chakra blend is infused with different crystals, Bachflower remedies and the matching chakra color,that will correspond with the vibration of the specific chakra." €159.90. From Dawn Spencer Hurwitz, Cimabue in 30 ml Eau de Parfum: "Cimabue, the Italian artist who initiated the Florentine Renaissance, inspired Dawn to create her most revered perfume. Cimabue is a complex and hedonistic fragrance that opens with the innocence of citruse notes and quickly gives way to the opulent and golden warmth of saffron, the star note in the scent. Exotic spices of clove, cardamom and nutmeg slink and slither until you are enveloped in the classic creamy drydown of sandalwood, vanilla and sweet bezoin combine to deliver a pefume as complex and multi-dimensional as a Botticelli." $105 at Indiescents. 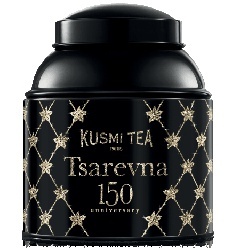 From Kusmi, the 150th anniversary edition of Tsarevna tea: "Packaged in a gilded black anniversary tin, this aromatic blend by Kusmi Tea pairs black tea and orange peel with scents of orange, spices, vanilla, almond and licorice." $29.90 at Bloomingdales. 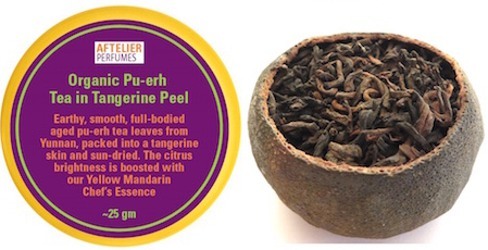 From Aftelier, Organic Aged Pu-erh Tea in Tangerine: " Delicious high quality Pu-erh tea leaves from Yunnan are aged for four years and packed into the rind of a whole tangerine. Sun-dried for one week, the peel turns a deep brown. During the drying, and then aging, the pu-erh tea absorbs the flavor and fragrance of the tangerine. This pu-erh tea is earthy, smooth and full-bodied highlighted by exceptionally light notes of citrus. The citrus brightness is boosted with Yellow Mandarin Aftelier Chef’s Essence. Be sure to break off some of the dried tangerine rind and brew together with the tea. It is a delicious combination of the pu-erh flavor and layered beneath sweet notes of tangerine. The leaves may be re-infused several times retaining evolved versions of their fragrance and flavor." $20. Seems like a lot of money for soap bubble–though I have to admit, I’d have loved those as a child. It is a darned lot of money. I would like to have one bottle but I’m sure I’ll never pay for it. I wish I liked that Tsarevna tea because they always have beautiful canisters. This year is no exception. I think it’s the licorice I object to. Licorice teas always taste like sweet n’ low to me. I stocked up on Violet and St Petersbourg instead. The bubbles look like fun and I love that someone thought to make a Cimabue perfume. I’m going to have to read up on that one because I’m quite intrigued. How does one go about making a Cimabue perfume? It doesn’t seem like a subject easily adaptable to perfume. Nordstrom has a 3-pack of the travel sized Marvis toothpaste in Classic Strong Mint, Whitening Mint and Cinnamon Mint. This package is much easier to handle than the 7-pack. For the perfumista who has everything – a copper distiller to make your own floral waters and essential oils…item comes with a lifetime guarantee! Ooh that would be cool! And it’s not as expensive as I thought it would be either. Though I can imagine it wouldn’t be cheap to gather enough plant material to make meaningful quantities of oils. 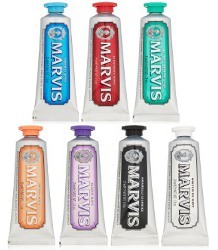 Have always wanted to try Marvis toothpastes. The Aftelier tea sounds delicious. Kicking myself for not having jumped on the fox mugs Upton had briefly–they were quite appealing and promptly sold out (they have a snowy owl, but not as covetable as the fox, IMHO). I missed the fox mugs altogether! Upton is doing free shipping on $60+ this weekend. Marvis toothpastes are wonderful: they’re stupidly expensive but you only need a tiny dab (like the size of a pencil eraser) to get tons of intensely flavoured foam. The licorice is my go-to toothpaste: it’s heaven. Sephora has that seven-pack for the same price as Amazon. I say treat yo self. “Treat yo self” is my mantra at the moment . I umm am hooked on Marvis toothpaste. No more mainstream toothpaste for me as I ordered a ton with the VIB 20% discount. Mon beau Sapin! Oh my heart, that’s cute. Being the man-child that I am(at 40! !lol)I of course want those bubbles!!WANT! !I received the most wonderful set of white ceramic discs infused with patchouli oil some years back as a gift.They still are very much fragrant!I love the concept. It is a great idea. Diptyque does scented ceramics too, but surprised more brands don’t do them. Even though I would never pay $75 for bubbles, I still kinda want the bubbles. The Cimabue and the Aftelier tea are tempting too. I haven’t tried any of her teas.